05/30/2017- S.C. Emergency Management has released the 2017 Hurricane Guide. Click here to view / download the guide. Stations 9, 11, 2, and 19 were dispatched to a structure fire at 286 Inway Ln on Saturday, May 27, 2017 at 05:32. Engine 9 and Medic 9 arrived 10 minutes later to find a working structure fire in a single story fixed residence. A 1.75" handline was deployed and the fire was quickly knocked down. All occupants had self extricated but a dog was still in the home. Click here for more information. 5/23/2017- Colleton Medical Center will be providing lunch for First Responders in honor of EMS Week tomorrow, 24-May from 11:00 to 13:00. The luncheon will take place near the ED Ambulance Ramp across from the helipad. All Fire-Rescue personnel are invited to attend. An adult male received non-life threatening injuries after his truck left the roadway in the 6900 block of Lowcountry Highway (US Hwy 21) near Black Creek Road Tuesday morning 23-May. The incident was reported to 9-1-1 at 03:41. Bystanders stopped to assist, but had problems accessing the driver. 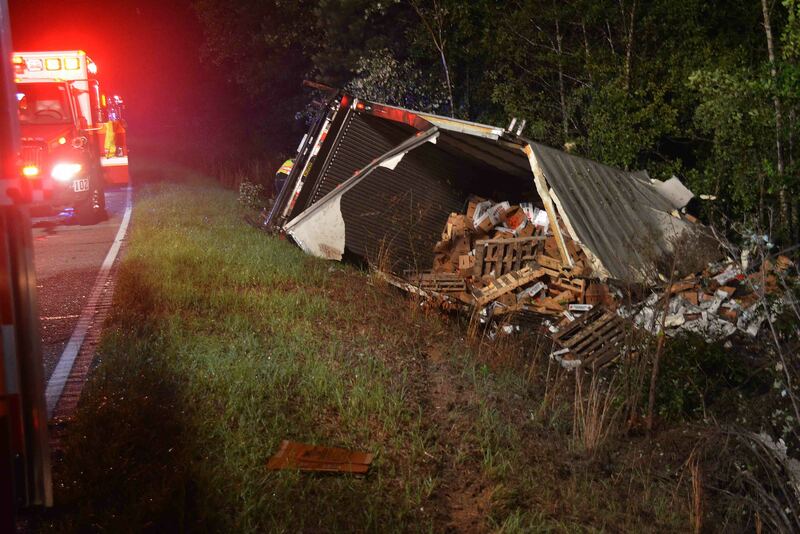 The southbound truck, which was hauling produce, drove down an embankment and overturned causing heavy damage to the truck. Click here for more information. 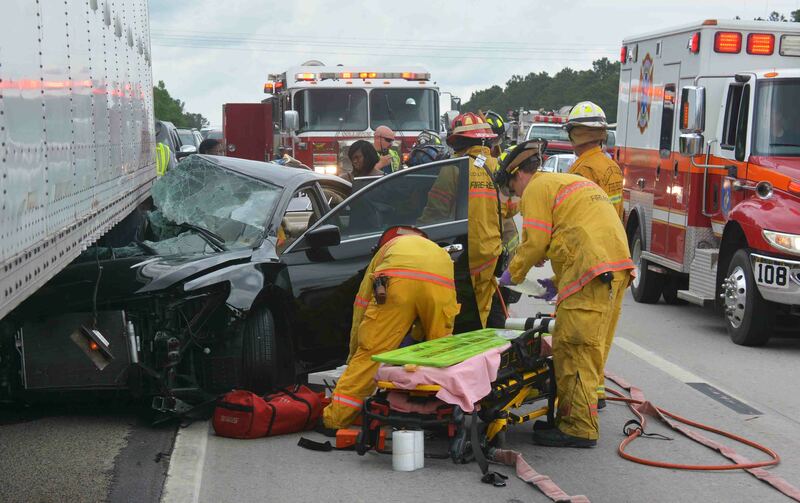 Ten people were injured, one critically, in a high speed five car collision on Interstate 95 near the 64 mile marker southbound, Monday afternoon 22-May at 13:41. All vehicles were travelling southbound when several collided causing a Nissan Altima to drive under the trailer of a tractor trailer truck. The car became wedged under the trailer and the rear tandem wheels drove up over the car crushing the front seat passenger in the car. Click here for more information. 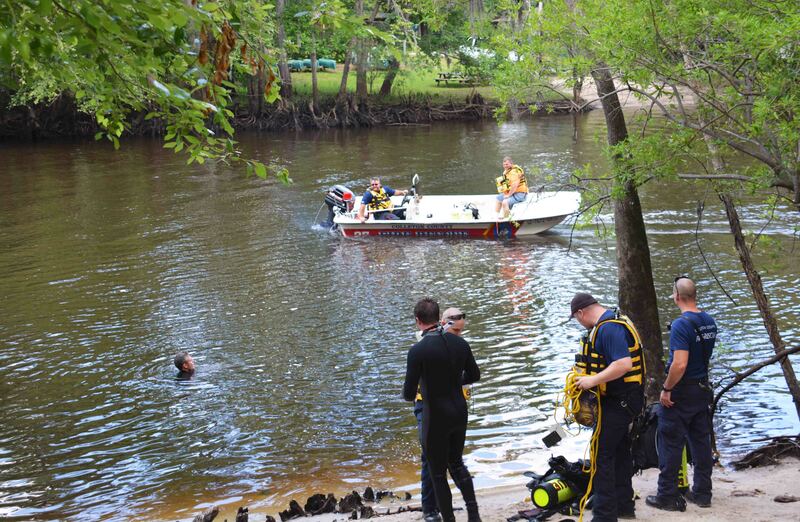 A Colleton County teenager drown while swimming in the Edisto River at the Colleton State Park Sunday morning 21-May. At 11:42, 9-1-1 received two calls reporting a 16 year old male had gone under the water and had not come back up. The swimming area is located at the rear of the State Park which is at 147 Wayside Lane off of Jefferies Hwy (US Hwy 15) at the Colleton / Dorchester County line. Fire-Rescue dispatched a boat with rescue divers to the scene. Click here for more information. Two adults and a child were killed and another child was injured in a shooting incident at a residence located in the 21700 block of Lowcountry Hwy. (US Hwy 21) Tuesday afternoon 16-May. At 16:53, 9-1-1 received several reports of the incident. Callers advised of people down in the street. Sheriff’s Deputies cleared the scene. Firefighter-Paramedics found bystanders with a 9 yr. old female in the roadway and 5 yr. old female across the street who was not injured. Click here for more information. 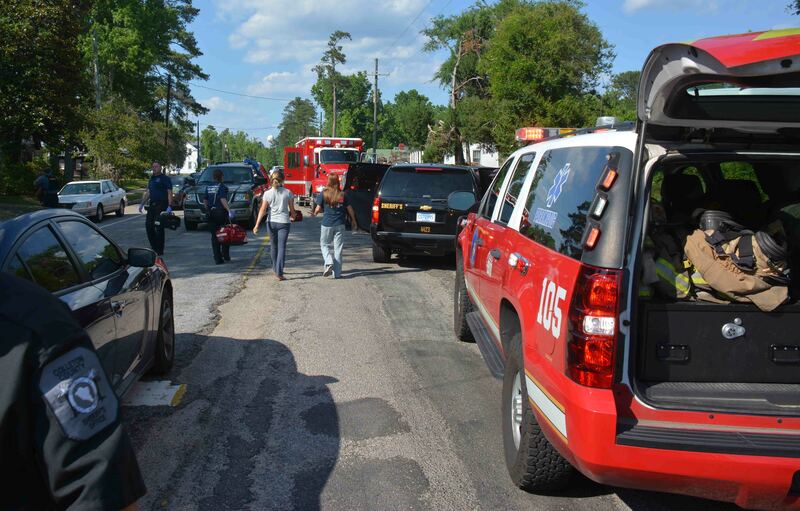 A 22 year old Beaufort County man suffered multiple traumatic injuries in a single vehicle crash in the 4300 block of Green Pond Highway (SC Hwy 303), Saturday afternoon 13-May at 17:58. The Ford pickup truck was traveling northbound on Green Pond Hwy. when it left the roadway at a high rate of speed and entered the southbound ditch. 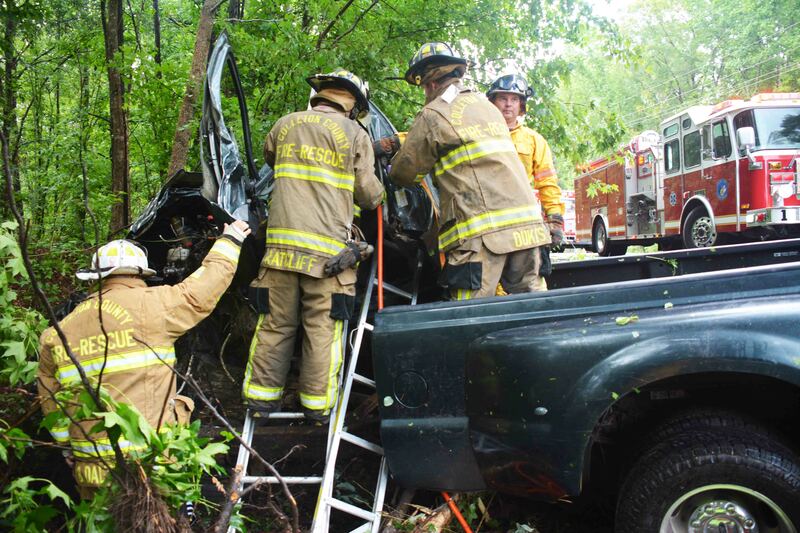 The truck went down an embankment, then struck several trees causing heavy damage to the truck and trapping the driver. Click here for more information. Three families were displaced following a fire in an apartment building located at 2275 Green Pond Hwy. Wednesday afternoon 10-May. 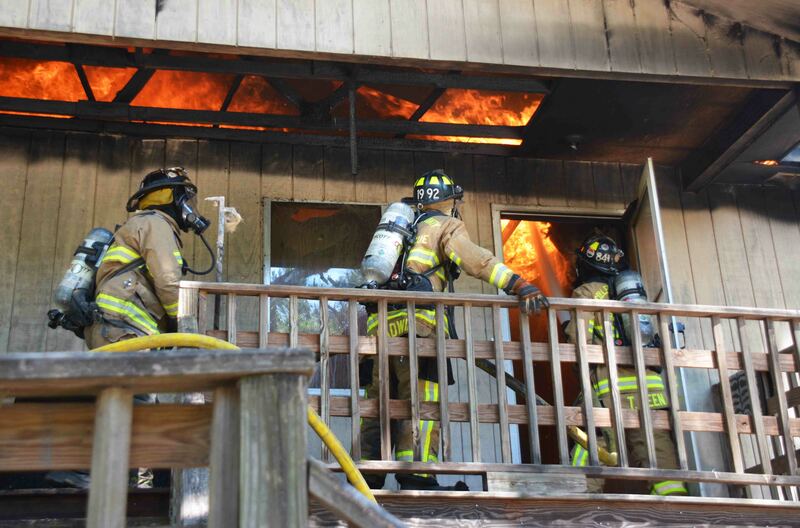 At 14:28, Colleton 9-1-1 received the first report of the incident with the caller reporting flames coming from the roof of the two story building. Engine 19 was in the area and arrived minutes later to find heavy smoke conditions and flames visible from the rear of the building and the roof. Click here for more information. 5/8/2017 - Colleton County Fire Rescue is excited to announce our partnership with Med Trans Corporation to operate Colleton Air Rescue Evac (C.A.R.E.) Flight, an air ambulance coming to the Lowcountry in June. Click here for more information. 5/1/2017 - Colleton County Fire-Rescue recognizes National Stroke Awareness Week. More information is available here.